Amanda’s note: Here is another wonderful contribution from Ramya Venkateshwaran who writes from her home in India. 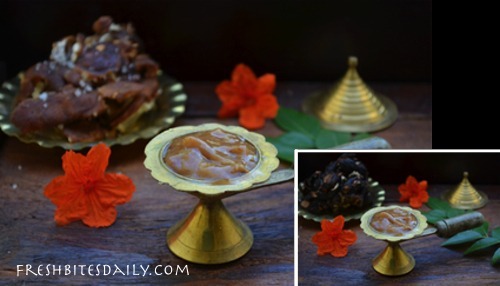 Ramya describes her family’s method for making tamarind paste along with a must-try recipe. Find her on her website WildTurmeric.net for more ideas on healthy living. ~~~Usually during summer season, here in India, we are busy making homemade oils, powders, and other things required for the whole year. One important thing that we regularly do is collect and store tamarind — we use it almost daily. We have tamarind trees in our farm and the whole process of collecting and storing takes weeks. We collect ripe tamarind pods from the trees and then sun dry the pods to break the shells easily from the fruit. Once the shell is broken, the seeds are removed completely from the fruit because if we store it along with the seeds, the tamarind will spoil sooner. We store tamarind in huge ceramic or clay pots by layering it with crystal salt. This method of storing tamarind dates back many centuries and is the best way to store it. The tamarind in the first picture is fresh and is usually light brown in color. Once we store it with salt in ceramic pots, it will get darker, almost black in color (the one that you see in the second picture in the inset below). The darker one is the one that we use year round in our cooking but since we use tamarind almost daily, we have to soak it in water daily and then make tamarind extract. The problem is that a lot of tamarind is wasted if we make fresh tamarind extract everyday so we make tamarind paste and then store it in the refrigerator. It lasts for almost 15 days in the refrigerator. Tamarind paste is sold everywhere now but it usually has some preservatives, so I always prefer to make it at home. To make the tamarind paste, take about 250 gm of tamarind in a pot along with 1 tsp of crystal salt and add water until the tamarind is completely immersed in water. Close with a lid and boil until the tamarind is cooked. You know it is cooked with the smell and it will be completely mushy. Let it cool and grind to a smooth paste in a dry mixer. Store it in a glass bottle in the refrigerator and always use a dry spoon when handling it. 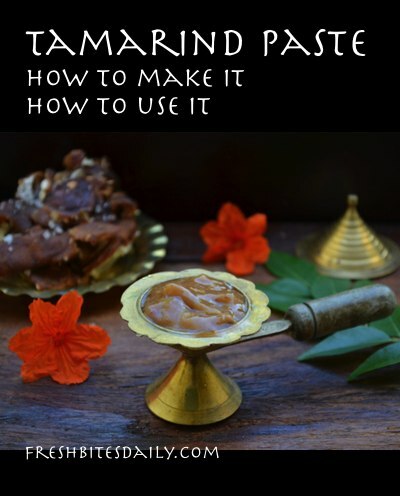 You can use tamarind paste for making all south Indian gravies and in drinks like jaljeera (a popular, healthy Indian summer drink) which I have already posted (here). You can also make a sweet dipping sauce with it for all kinds of meat and crispy vegetables — it is totally awesome and very healthy. This is one sauce I am totally addicted to and I make very often. Soak the dates in water and grind to a smooth puree in a mixer. Boil brown sugar in little bit of water (around 1/4 cup) to get a syrup consistency. Once the brown sugar is dissolved completely, add dates mixture, paprika and salt. Boil till it gets a sauce consistency. Dry roast cumin seeds till light golden and powder it well in a mortar and pestle. Add the cumin seed powder and switch off.